This sprawling bungalow is designed to make the best available use of natural lighting! The 10,000 sq ft home of Tindustrialist Giridhar Kale has been designed keeping in mind the style and comfort of the family members from young to old. With space provided for a squash court or table tennis room for the younger family members for the future, the home is a space where the family also entertains their friends and extended family quite often in the extended garden space. It is definitely a challenge to incorporate vaastu principles and the needs of each member of our family, but the architects have done a fantastic job,” Kale says. “Sun pours in through each and every nook and corner of our home and the home has been cus-tomised according to the ideas and wishes of the youngest to the old-est member of the home. My elderly mother loves the 1,500 sq ft puja room and the tulsi space where she spends a lot of her time. I also have a home office space here, which I plan to use eventual-ly,” he adds. This residence has a triple height atrium at the centre with skylight. The double height ter-race and the atrium help visually connect the three floors of the res-idence and also filter a lot of natu-ral light throughout the house. The toilets are done using Italian glass mosaic. The selection of the materials for the toilets was done with the individual end-users and it has a strong character to it. 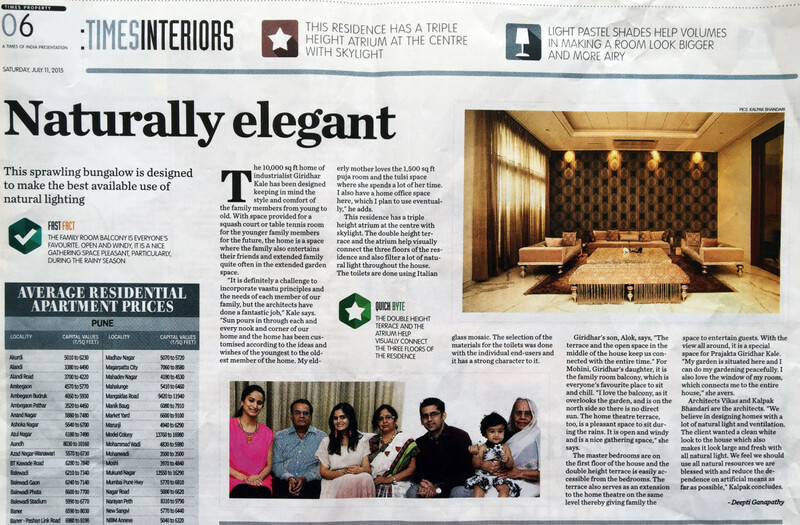 Giridhar’s son, Alok, says, “The terrace and the open space in the middle of the house keep us con-nected with the entire time.” For Mohini, Giridhar’s daughter, it is the family room balcony, which is everyone’s favourite place to sit and chill. “I love the balcony, as it overlooks the garden, and is on the north side so there is no direct sun. The home theatre terrace, too, is a pleasant space to sit dur-ing the rains. It is open and windy and is a nice gathering space,” she says. The master bedrooms arc on the first floor of the house and the double height terrace is easily ac-cessible from the bedrooms. The terrace also serves as an extension to the home theatre on the same level thereby giving family the space to entertain guests. With the view all around, it is a special space for Prajakta Giridhar Kale. “My garden is situated here and I can do my gardening peacefully. I also love the window of my room, which connects me to the entire house,” she avers. Architects Vikas and Kalpak Bhandari are the architects. “We believe in designing homes with a BE of natural light and ventilation. The client wanted a clean white look to the house which also makes it look large and fresh with all natural light. We feel we should use all natural resources we are blessed with and reduce the de-pendence on artificial means as far as possible,” Kalpak concludes.